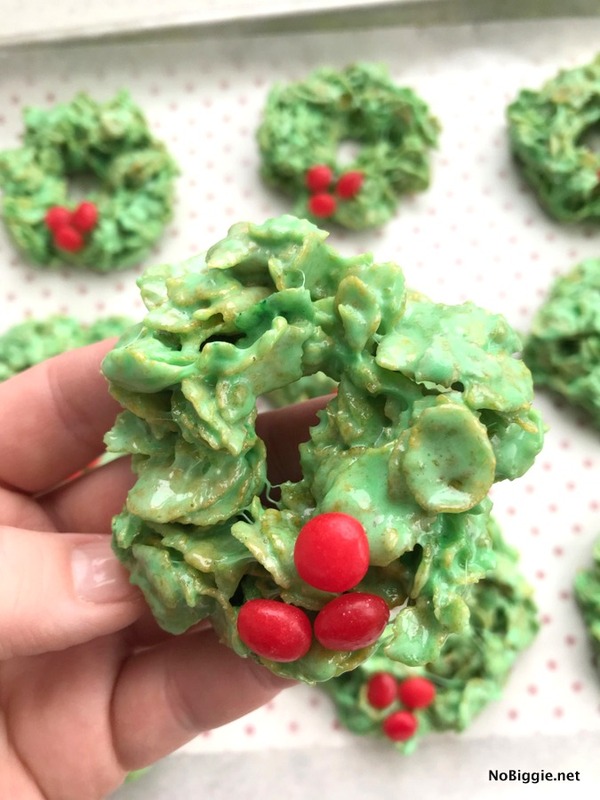 These Christmas Cornflake Wreath Cookies with mini marshmallows are such a fun cookie to make with the kids, because they are no bake, festive and super easy to mix up. We love making cookies this time of year and when they are guaranteed to turn out great, we love them even more! In a large pot on the stovetop, melt the butter over low heat. Once melted, add the mini marshmallows and stir until all the mini marshmallows are completely melted. Pour the cornflakes cereal into the pot with the melted marshmallows. Stir together until the corn flakes are well coated. Using a 1/4 measuring cup (greased with butter to prevent sticking), evenly portion the warm cereal mixture onto the parchment paper. 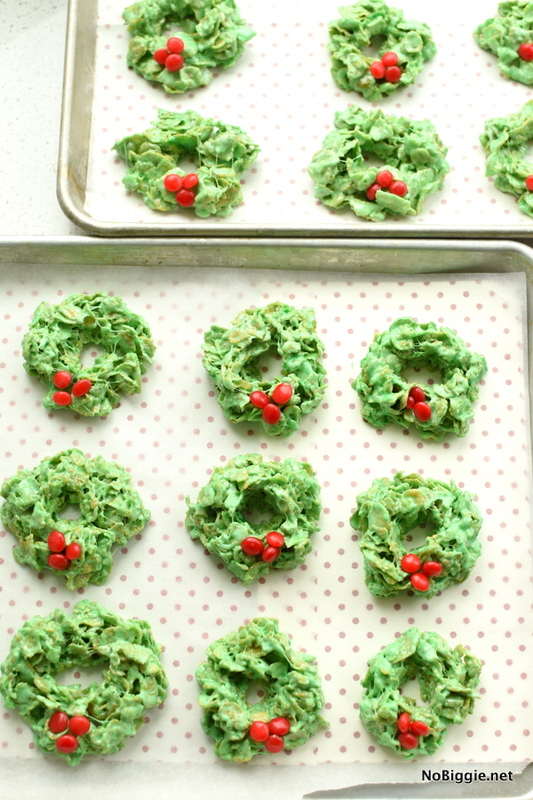 Using buttered fingers, quickly shape the mounds into individual wreaths. Dot with cinnamon candies for a festive touch. 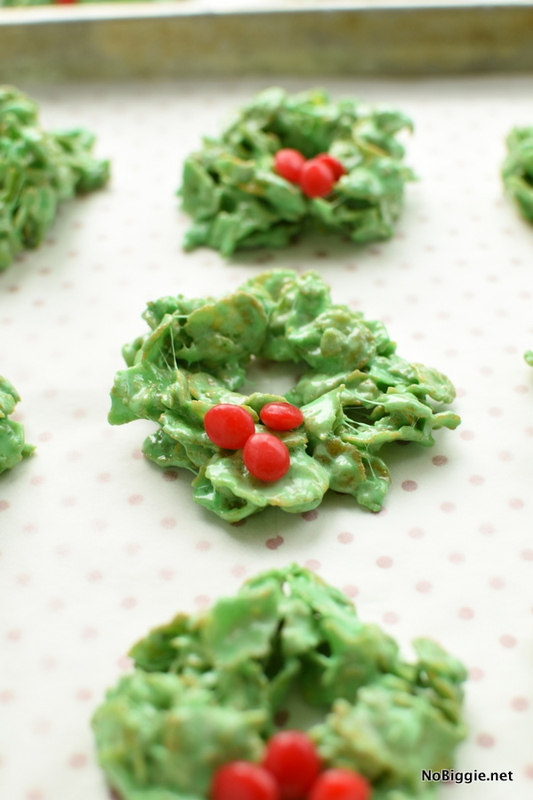 Can you add almond extract to Christmas cornflake wreath cookies? Yes you can add flavors like almond extract or vanilla extract to these cookies if you prefer. About 1 teaspoon of almond extract would be perfect. You could also try 1/2 teaspoon almond extract and 1/2 teaspoon vanilla extract together! 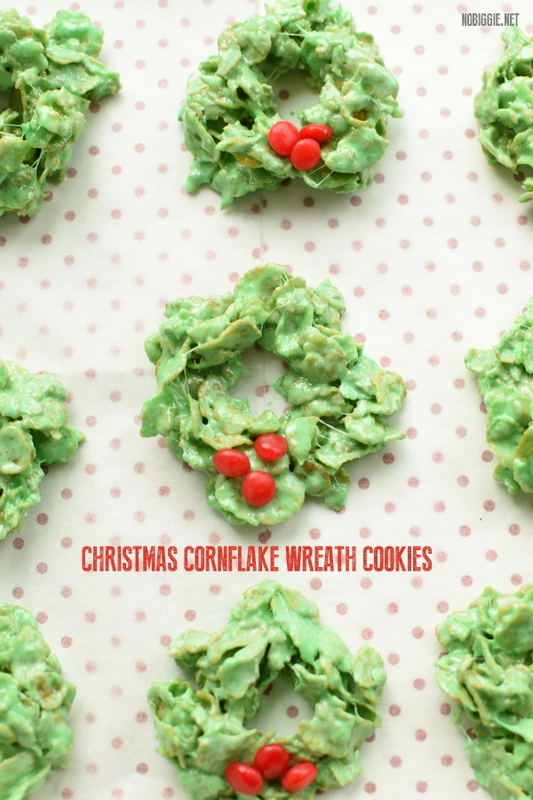 Can you make Christmas Cornflake Wreath Cookies with corn syrup? 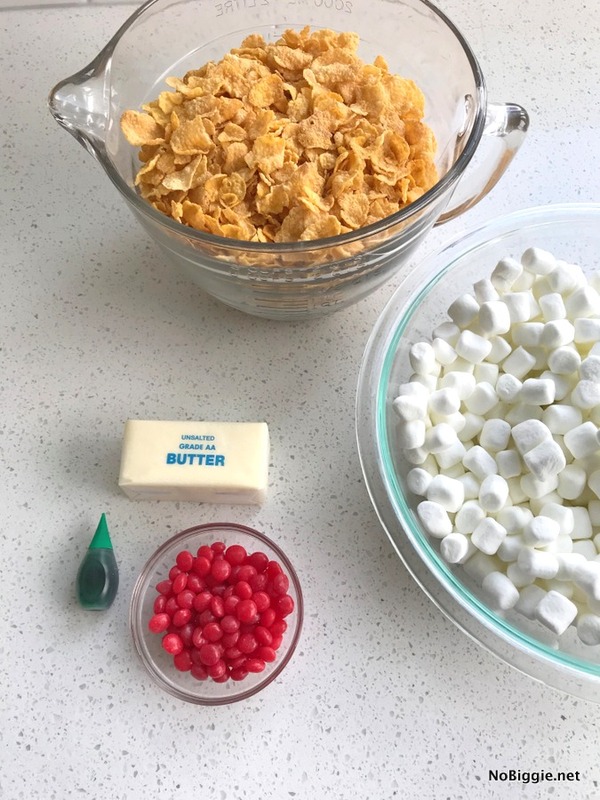 -You can make these cornflake cookies with corn syrup, be we prefer them without corn syrup. We like the chewy texture the mini marshmallows give these cookies. Plus it’s easier to measure mini marshmallows compared to measuring corn syrup. 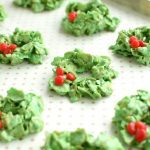 These Christmas Cornflake Wreath Cookies are festive and fun cookies to make with the kids before Christmas. So easy to make too, because they are no bake! Pour the cornflakes into the pot with the melted marshmallows. Stir together until the corn flakes are well coated. 1 teaspoon vanilla extract OR 1 teaspoon almond extract OR 1/2 teaspoon almond extract with 1/2 teaspoon vanilla extract. 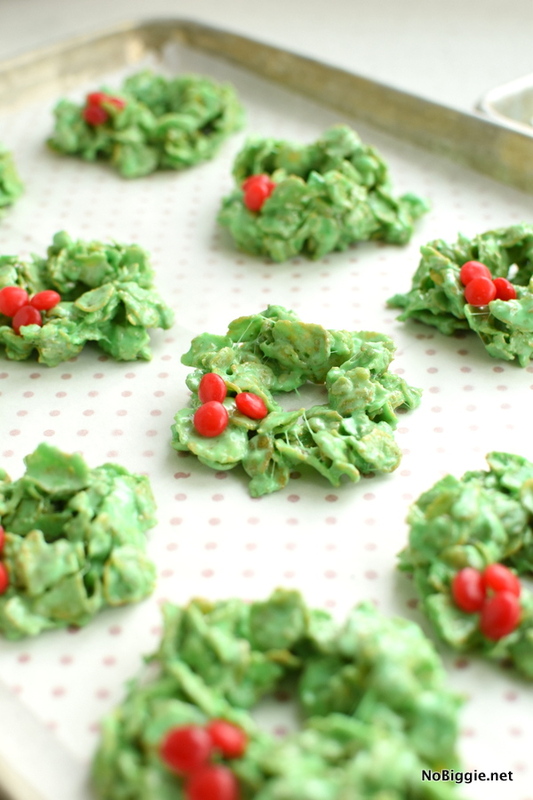 Butter your fingers before forming the cookies into the shape of little wreaths for less stickiness. Get your sheet pans ready with parchment before you begin. We love these pre cut parchment paper sheets. Store these cookies between parchment in an air tight container up to one week.